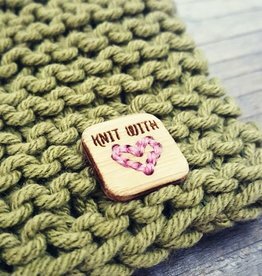 Size: * .85" x 1" 1/2" x 3/4"
Add a touch of whimsy to your knitwear! The Katrinkles Whale Buttons are a great way to add a touch of nautical whimsy to your next handmade item. The whale design is laser etched into each oval button that is made from sustainable bamboo plywood. Although these buttons are machine washable, it is recommended to handwash to prolong their lifespan. These buttons come on a card of 4 and are available in 2 sizes.